My girls inherited something really terrible from their father. I know this is going to come as a surprise to many but I’m not an ice cream girl. Don’t get me wrong. I will eat ice cream and thoroughly enjoy it but I wouldn’t choose it over a warm slice of fruit pie or better yet, a savory dish. The hubs on the other hand would eat ice cream anytime of the day no matter how full he is. Ice cream is his thing. Unfortunately for him, we don’t get it often because not only is the hubs obsessed, so are my girls. They have the curse of ice cream and innocently claim that it just fills the cracks. Yes, this is a problem. But no one can deny the fact that a cold treat on a hot summer day is the best thing ever, especially when it is homemade. And with the big frozen banana ice cream craze that has struck the internet, I thought why not? 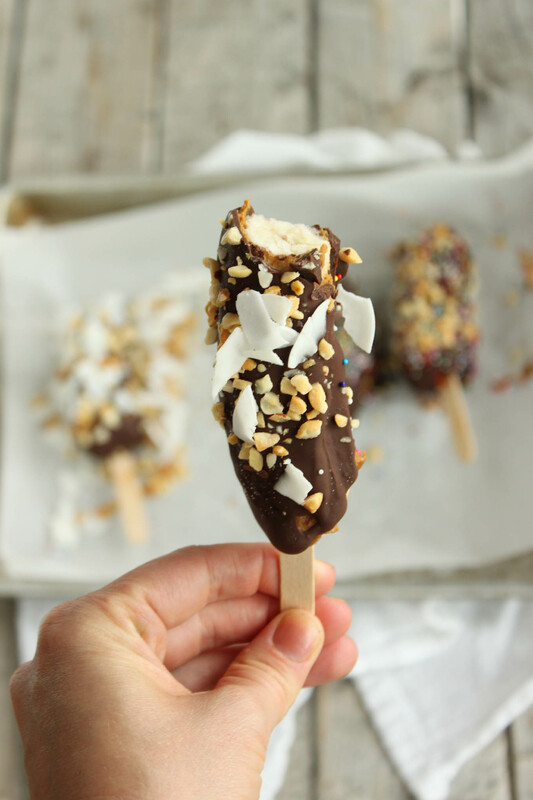 So we simplified the frozen banana ice cream and just stuck with a frozen banana on a stick. Once you have that, the options are endless. 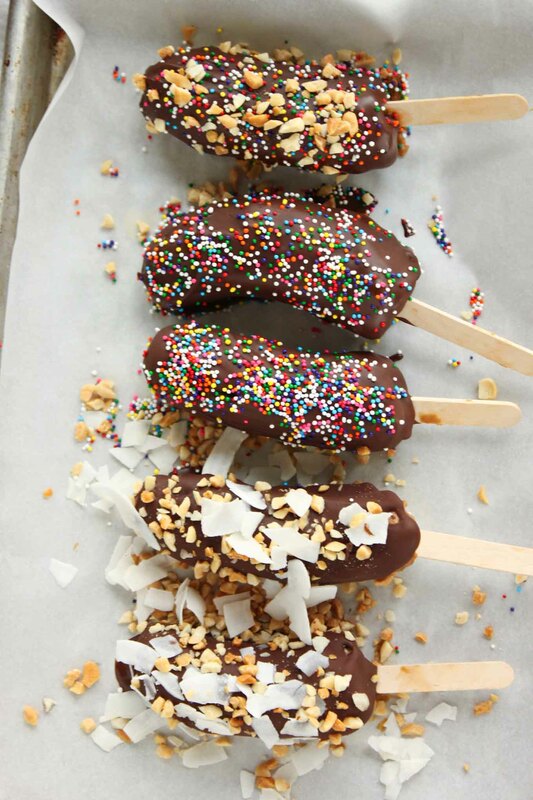 We stuck with frozen banana coated in some sunbutter (peanut butter or almond butter would work as well), coated it in a chocolate shell and dressed it up with some sprinkles, finely flaked coconut as well as some chopped nuts. Heeeellllo monkey tails, because that’s what they are officially called. Get it?!? Okay, I know pretty lame but the kids love it so it really is a win win all the way around. Like I said, the possibilities for these monkey tails (a.k.a. frozen banana on a stick) are endless. I’m thinking banana dipped in that butterscotch sauce and the covered with a chocolate coating. Or how about a caramel frozen banana. This is the beauty of it, They can become whatever you darn well desire. That is why the sprinkles are hidden in the highest cupboard and they are only allowed out on special occasions. Not that it matters, it’s not like my floor needs cleaned every other hour of the day anyways. The janitor (our dog) does a decent job of keeping things cleaned, but even he gets tired of keeping up. Speaking of kids, did you know that my oldest (4yr old) is now old enough to drive. Okay, seriously she thinks she is old enough. The conversation went like this. Ava: Hey mom, can I drive to town today? Me: What?!? Drive, no you are not old enough. Ava: How old do I have to be to drive, because I’m almost five. Addie: Ninety-nine…..four more times as Ava keeps getting more mad. Ava: I do not Addie! Mom! Addie said I have to be ninety-nine and I know that isn’t true. Addie is lying (said in a whiny voice). Me: You have to be sixteen, not ninety-nine and Addie has no idea what she is talking about so just let her be. She is just trying to make you mad and guess what she is winning. Me Thinking and crying inside my head: How can they possibly argue about everything and why is this starting so soon! I don’t even know why I thought it was necessary to share that, other than this is real life for me. Real life that totally exemplifies why I’m in this job. To show you that real people, with real life kid problems, a crazy life and living in a beautiful mess with little time, constant chaos can still choose the healthy route. 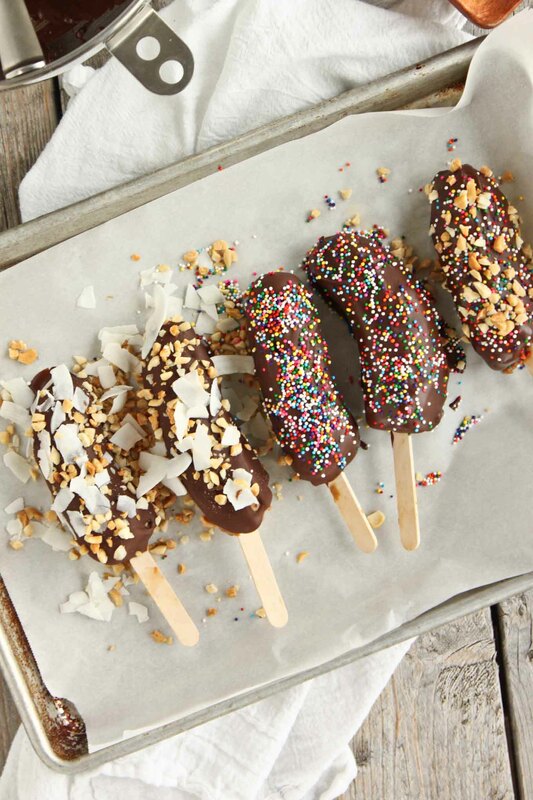 Also why these glorified banana’s on a stick are not just a kid treat but can be jazzed up for adults in need of a summer treat themselves. 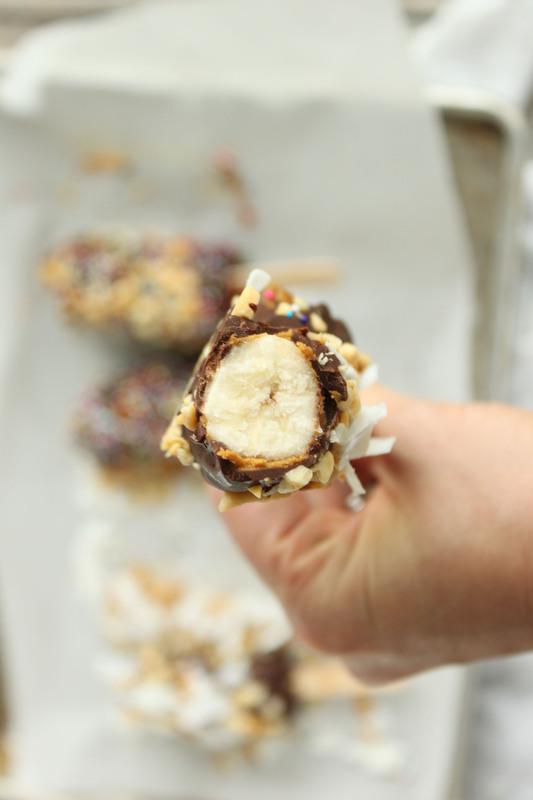 Frozen banana, slathered in peanut butter, coated in a chocolate shell and dipped in your favorite toppings. This is summer. So I tell you, it is perfectly fine to kick back, soak up some sun and enjoy this delicious family friendly treat without guilt or shame. Own it and enjoy it and please share your creations with us in the comments section. What would you slather on a banana and dip it in? 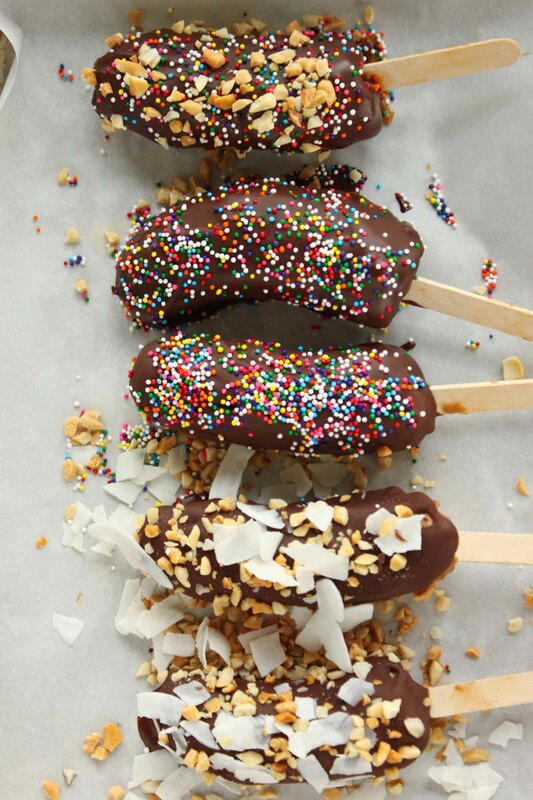 Cut the bananas in half and insert a popsicle stick into each one. Freeze for 1-2 hours or overnight. Once frozen you can make your chocolate shell. 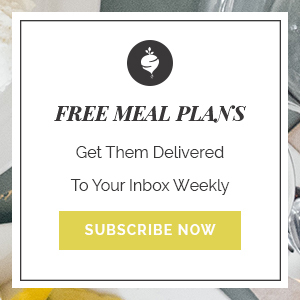 Using a double boiler (pan of boiling water with another metal or glass dish on top of the boiling water) melt the chocolate and coconut oil. 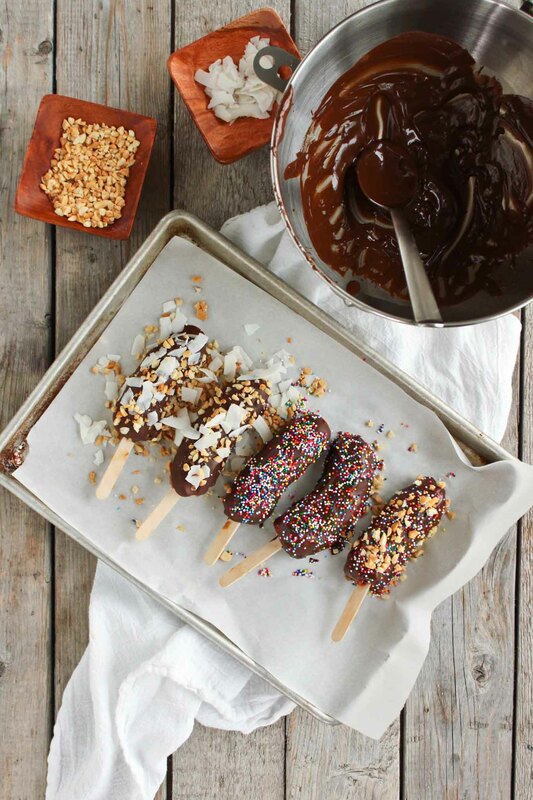 Dip frozen bananas coated in nut butter in the chocolate using a spoon to evenly coat. Repeat with remaining bananas and freeze again. Once frozen remove and enjoy!